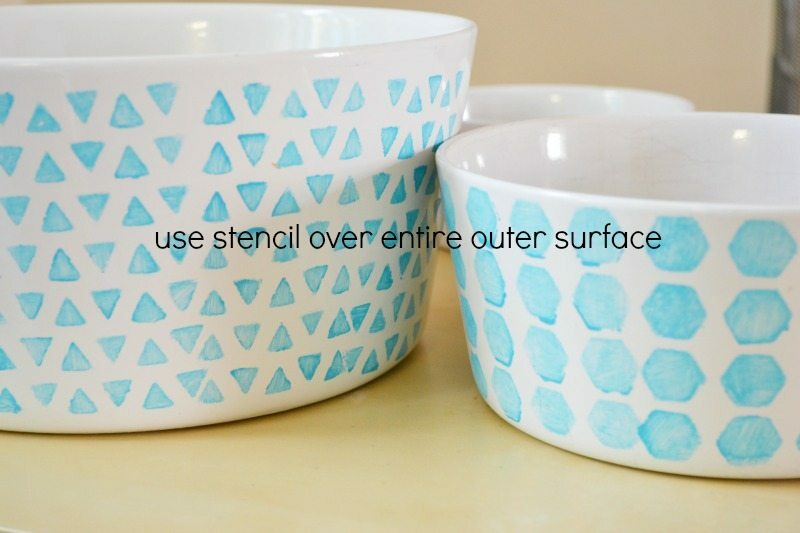 Painting dishes: get new life out of yours! easy tutorial. You are here: Home / Crafts & DIY / Diy Decor / How to paint dishes. Good morning fine ones! Here is a public service reminder of what a little paint can do to update your tired serving dishes. 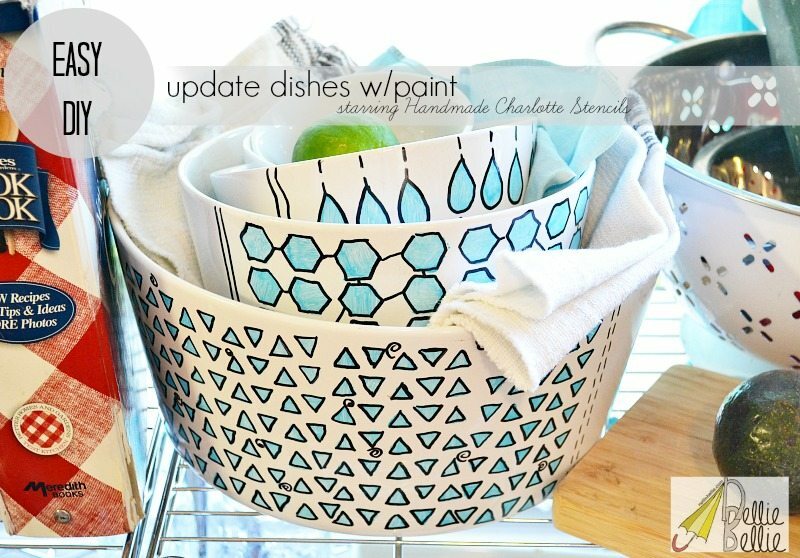 A little all-surface paint from dear Martha, a stencil from Handmade Charlotte, and your tired dishes are bright and vibrant again!!! Just remember, painting dishes needs to be kept to handwash items only, the lovely paint comes off far too easily in the dishwasher! 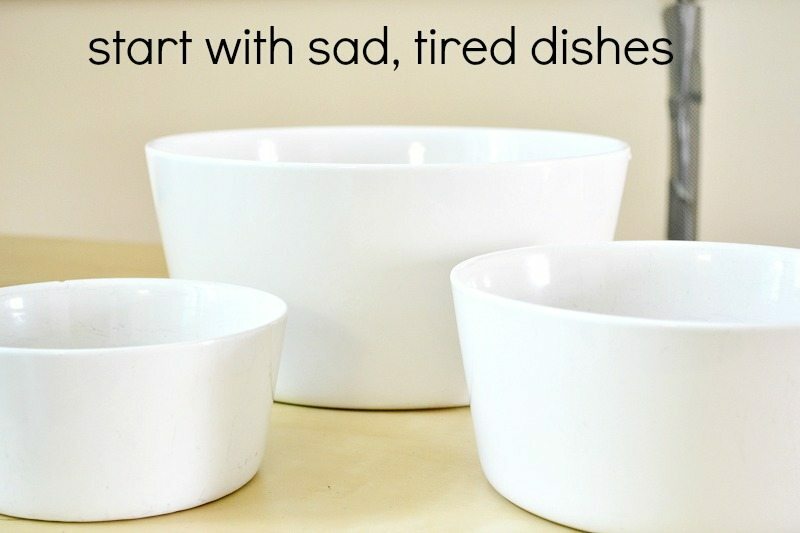 So, rather than buy all new…update your serving dishes! And, what a great gift to give…personalized dishes! 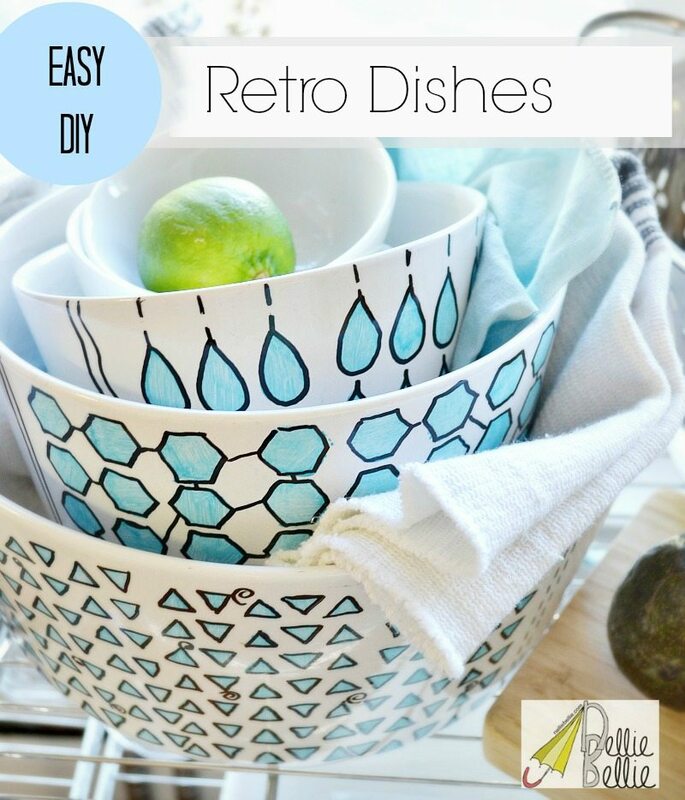 And, if you’ve never painted dishes before….hang tight, I have the easy tutorial! First, before you start painting…grab some alcohol and give your dishes a good wipe down. This will clean them well and give the paint a grippy surface, helping it last! 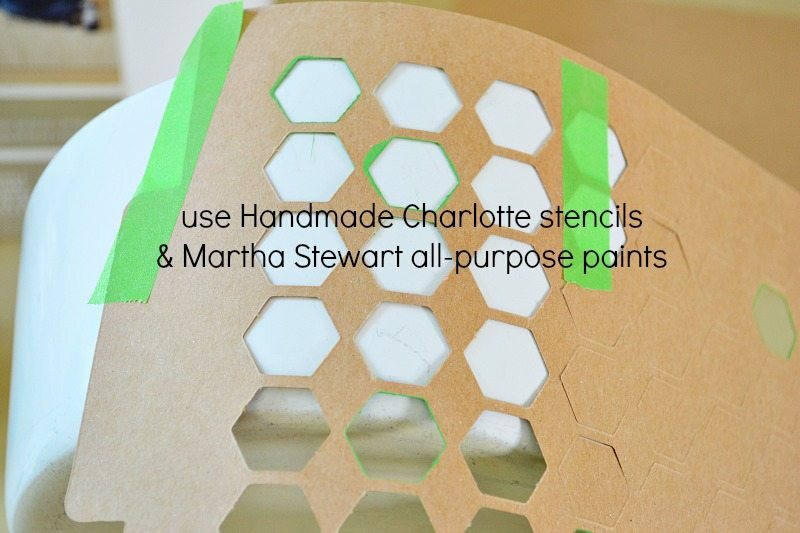 Grab some multi-surface paint from good ol’ Martha (a picture of it can be found HERE). That stuff is brilliant and should be stocked in your home (even if you aren’t a crafter!). It goes from fabric, to wood, to paper, to…dishes!! Love it! Also, you’ll need a stencil. Mine is from Handmade Charlotte and I chose it because of its all-over geometric pattern. You could free-hand if you feel confident, or pick up your own great design! Don’t forget a brush! Place the stencil on the dish with a bit of tape to keep it from sliding. And paint. Take it off and let it dry. Okay, here’s a couple tips to get this to move a bit faster. no need to have perfect technique. keep the coat light. as one dish is drying, do the next. by the time they are all painted, the first will be dry. Cover the whole dish with the stencil. Or, what your design suggests you to do. 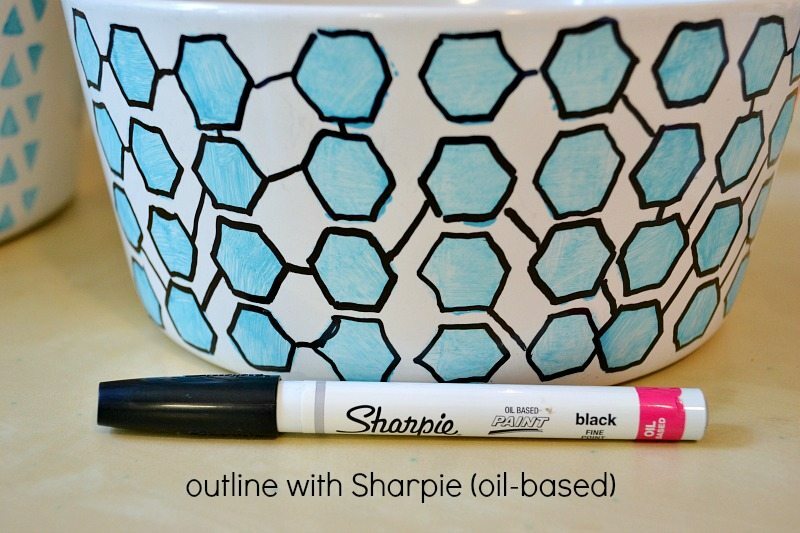 I recommend outlining your geometric shape with black. It makes it that much more interesting, retro, and fun. You can use a Sharpie…just be sure it’s an oil-based version so your design doesn’t come off in the wash! Here’s the important part that you shouldn’t skip!!! 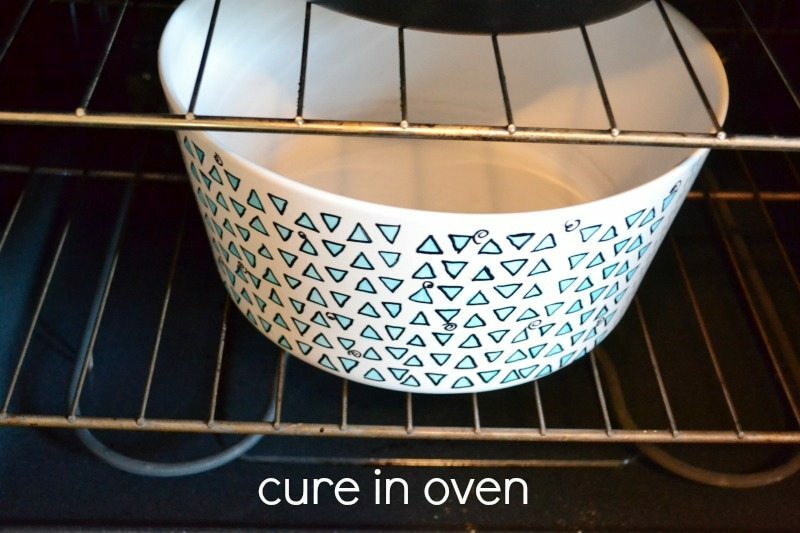 Cure your dishes in the oven. NO! Do not think of skipping this!! You’ll be sorry! Start with a cold oven, put them in. Turn it to 350degrees and time it after it has reached that temperature. 30 mintues afterwards, shut off the oven and leave the dishes in until it cools. I know…everyone forgets that part, or doesn’t know. Don’t skip!! 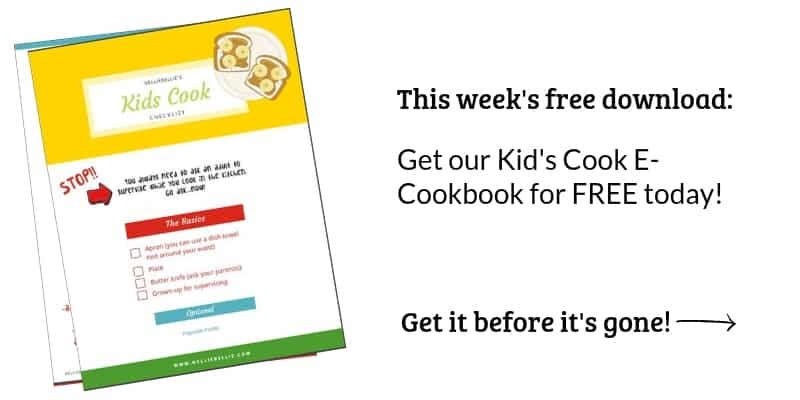 Here are more suggestions for updating your dishes, or creating great personalized gifts! Oh my cuteness! I love these! PERFECTION!